Indian Institute of Public Health Gandhinagar (IIPHG) is India’s first Public Health University, is a private university, sprawling in 50 acres of land, established on World’s Health Day (7th April, 2008) by Public Health Foundation of India (PHFI) under IIPHG Act 2015 of the Government of Gujarat, located in Gandhinagar city of Gujarat. The University offers both On-Campus Programs & E-Learning Programs with some training programs are also running successfully within the university. Some of the courses it offers are -A.F.I.H. 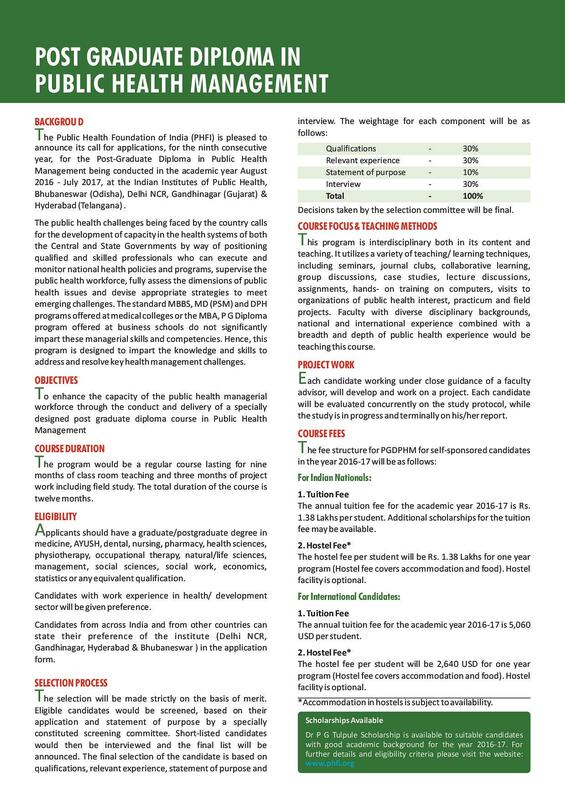 Course (Associate Fellow of Industrial Health), Associate Fellow of Industrial Health, a short course on the Fundamentals of Health Economics, Health Financing and Insurance etc. NH-147, Palaj Village Opp. New Air Force Station HQ, Gandhinagar, Gujarat-382042, India. The program is structured on a multi-disciplinary curriculum, including public health management, epidemiology and biostatistics, demography, social sciences, health promotion, health economics and policy, and other important disciplines with a duration of 2 years. 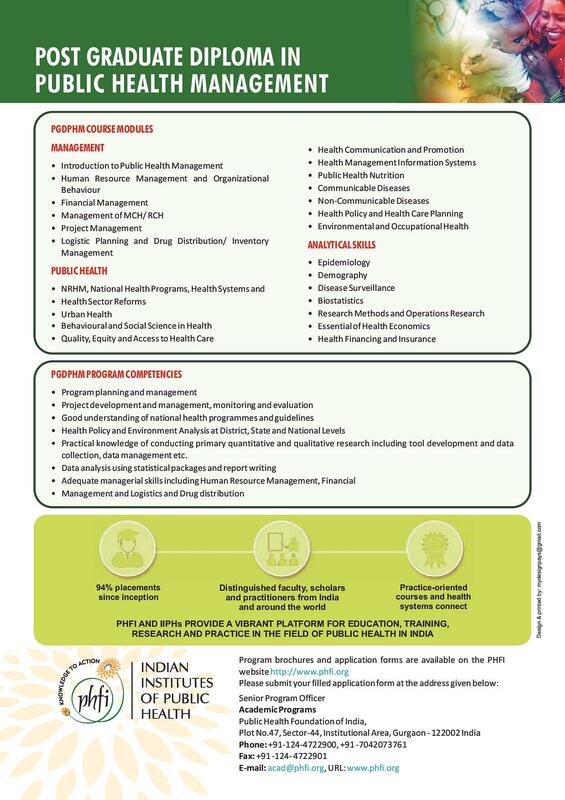 One who seeks IIPH Gandhinagar MPH Admissions could join this program. Bachelor's degree in any discipline from any recognized university in India and abroad, with at least 50% marks secured. This program, with a duration of 2 years, is designed to develop professionally trained administrators who can play a pivotal role and provide leadership in public/private hospitals and healthcare institutions. 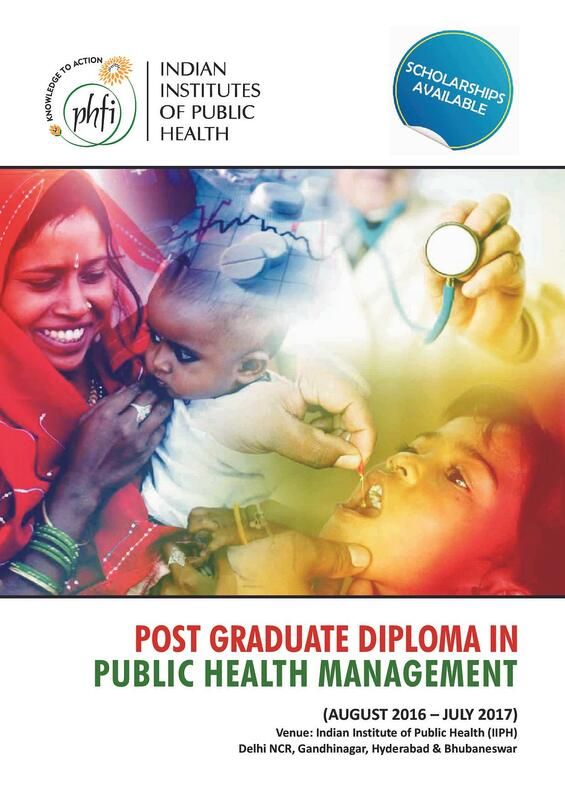 This one-year, full time course is developed for the Ministry of Health, Government of India under NRHM. 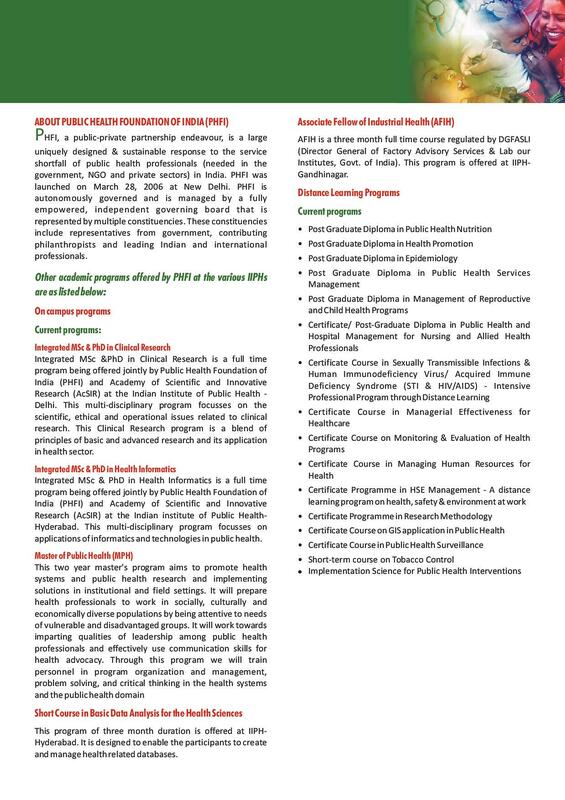 The program is structured with a focus on various specializations such as management of public health, biostatistics, social sciences, health communication and promotion, equity and health management information system etc. 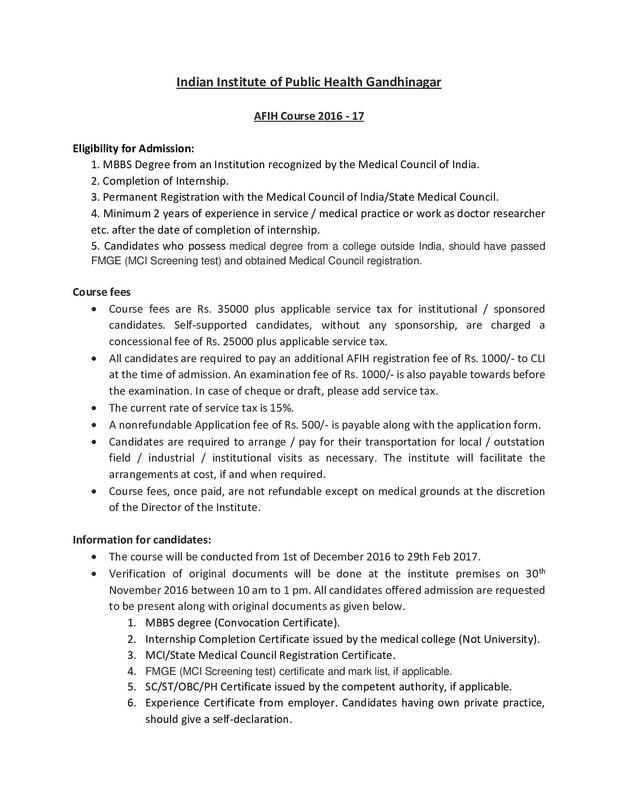 Applicants should have a graduate/postgraduate degree in medicine, AYUSH, dental, nursing, pharmacy, health sciences, physiotherapy, occupational therapy, natural/life sciences, management, social sciences, social work, economics, statistics or any equivalent qualification. AFIH is a three month full time course regulated by DGFASLI (Director General of Factory Advisory Services & Labour Institutes, Govt. of India). This course covers the basics of industrial health, occupational diseases, toxicology, safety and other related matters etc. 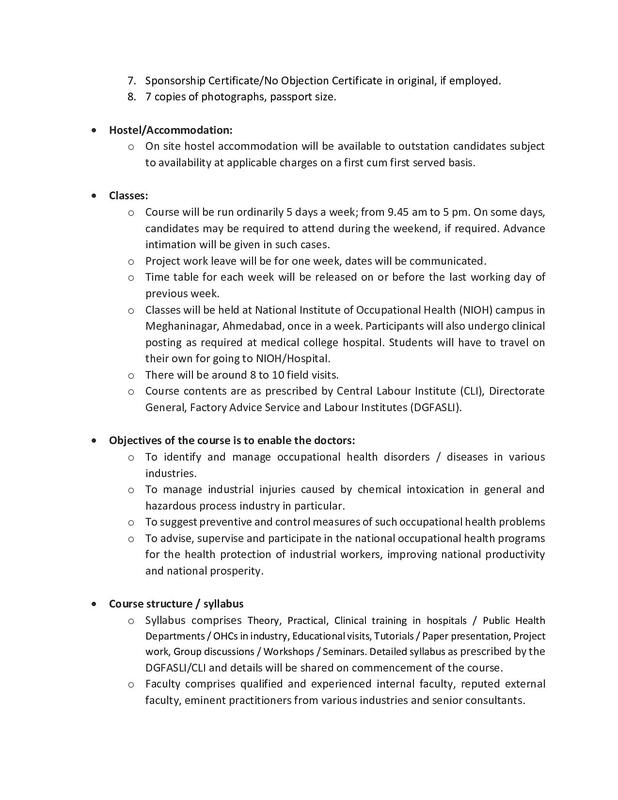 MBBS doctors with a minimum of 1 year experience in industry or relevant field of occupational health or 2 years’ experience otherwise, after completion of a compulsory internship. 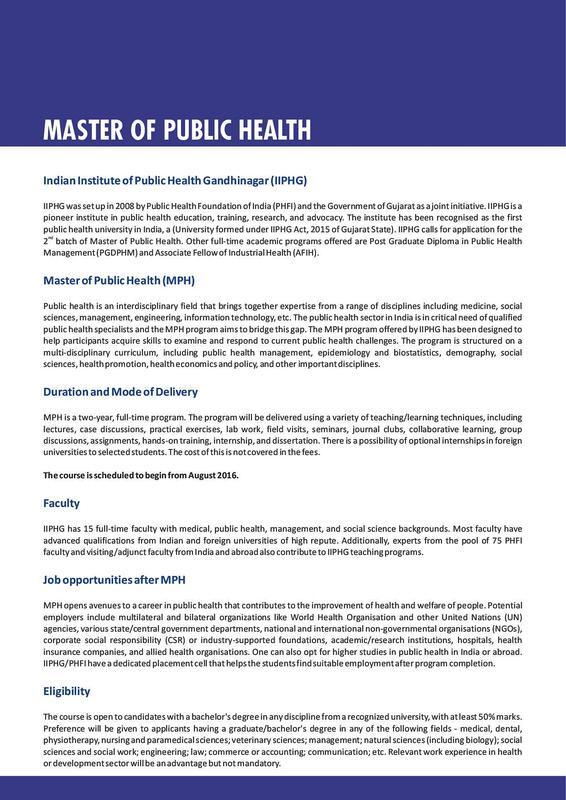 Apart from giving full time and E-Learning Program courses, Indian Institute of Public Health Gandhinagar (IIPHG) offers full time training modules in various disciplines in order to seek good intellectual and professional expertise individuals for the betterment of the society and our nation. Giving quality education with excellence in creating fine and professional candidates for the society, we are abreast in giving placement to our worthy and needy individuals securing good marks in the respective academics examinations under IIPH Gandhinagar Placements Criteria. The institute gives Scholarship to its students. 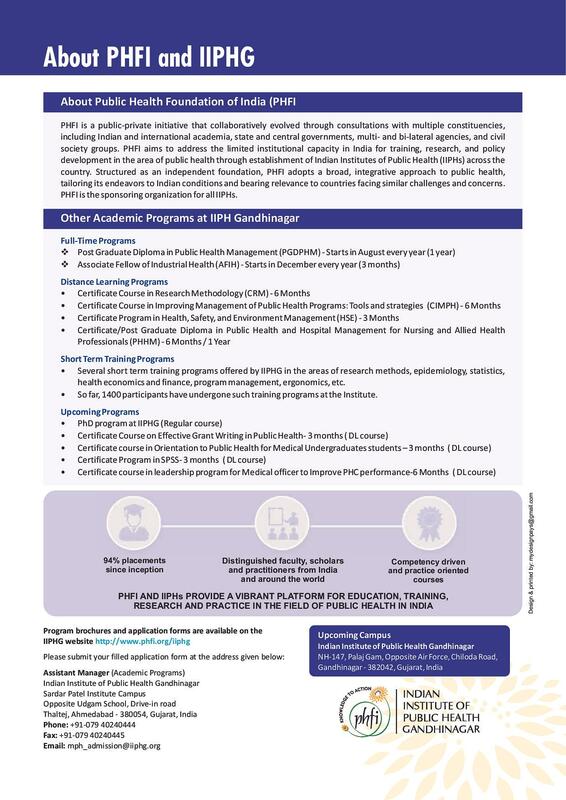 Scholarships are provided by the institute under the Dr. PG Tulpule Scholarship Fund to encourage the students who register in the PGDPHM program of PHFI and MMTC scholarship fund which provides scholarships to meritorious students who are from socially & economically deprived communities, for the (PGDPHM) program offered by IIPH. 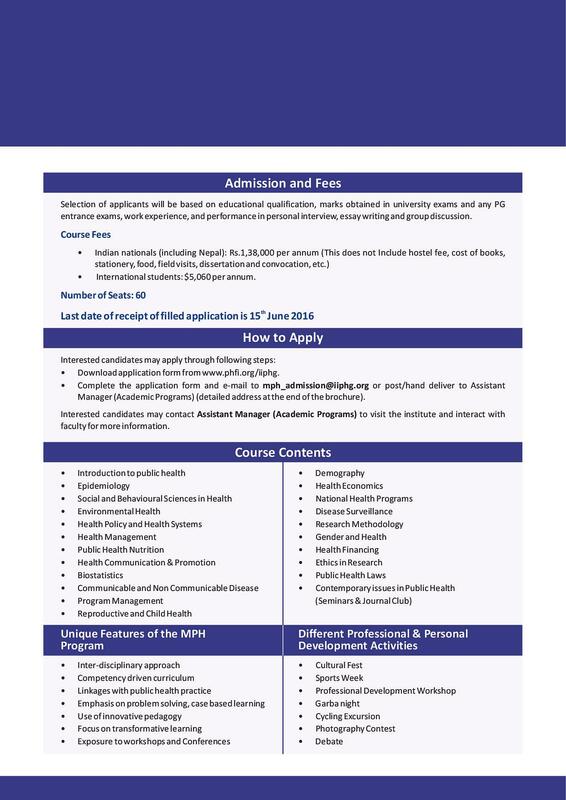 For more info in this sector click IIPH Gandhinagar Scholarships. A very good college to pursue master degree course in public health.I am very happy to pursue my career from IIPHG.Faculties are highly educated and all have experienced.They not not only busy in giving bookish knowledge,but they guide us and give us information about the current situation and current happenings in the world.There is no discrimination between the Junior and the senior in the the college campus.Seniors are very helpful for the freshers. A very good college for those who want to pursue their career in public health.Our college has a good digital library and online subscriptions of more than 400 journals which are accessible for both the faculties and students as well.Every facility is available within the campus.We do not have to go out for our daily needs.Faculty members are also very supportive and at the same time very helpful. Great experience and a very good college.Our college organizes various field visits for participant as a regular academic activity.This field visits are conducted as a part of course modules.This field visits helps us in gaining practical exposure.We are taken to various places as a part of these visits including civil hospitals, urban healthcare etc. As part of the academics - field visits, guest lectures, journal clubs and seminars have been the integral part of our courses has value to the classsroom session.All of these helps us to gain practical exposure.Placement cell of our college assists the students in job placements in the self-sponsored participants of the various program. It's a 2 year course.No entrance exam conducted for the admission of this course in our college.Admission process is based in purely merit.Before admission candidates have to appear in the personal interview and group discussion round.Graduation is the eligibility criteria for the students. The eligibility criteria for this course is Graduation.One should be graduate with minimum 50%marks in graduation for open category and for reserved category 45% marks are required.After that Students also have to face personal interview and group discussion round.A overall good academic career is required for the admission. 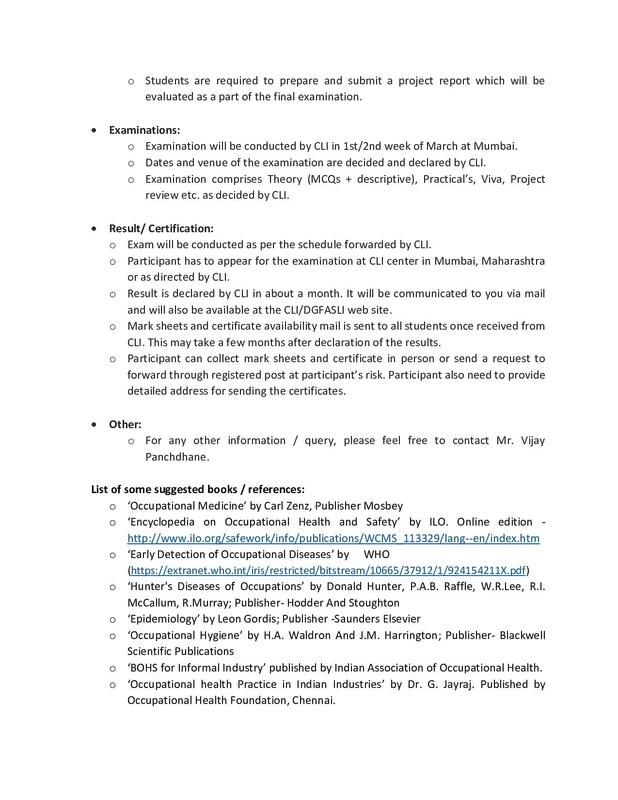 This program is only for MBBS Doctors.Our college conducts entrance tests for the admission into this course.As there is a limited seat so they conduct personal interview and group discussions as well.After qualifying in all theses criteria one can get admission in this course.My score was good in the entrance exam and also I successfully cleared the next 2 rounds.